Cirrocumulus is a cloud of the stratocumuliform physical category that shows both stratiform and cumuliform characteristics and typically appears as white, patchy sheets with ripples or tufts without gray shading. Each cloudlet appears no larger than a finger held at arm's length. 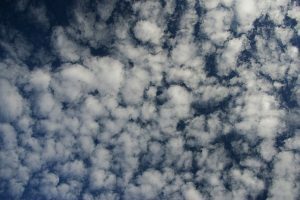 These often are organized in rows like other cumuliform and stratocumuliform clouds, but since they are so small, cirrocumulus patches take on a finer appearance, sometimes also referred to colloquially as "herringbone" or as a "mackerel sky". 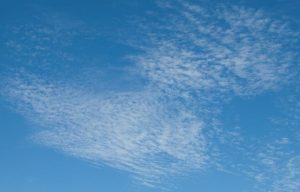 Cirrocumulus is coded CH9 for the main genus-type and all subforms. 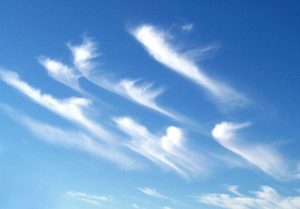 On planet Earth, cirrus generally appears white or light grey in color. It forms when water vapor undergoes deposition at altitudes above 18,000 ft in temperate regions and above 21,000 ft in tropical regions. It also forms from the outflow of tropical cyclones or the anvils of cumulonimbus clouds. 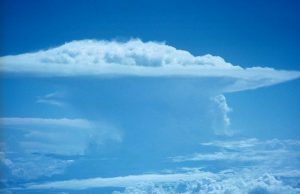 Cumulonimbus, from the Latin cumulus and nimbus, is a dense, towering vertical cloud, forming from water vapor carried by powerful upward air currents. If observed during a storm, these clouds may be referred to as thunderheads. Cumulonimbus can form alone, in clusters, or along cold front squall lines. These clouds are capable of producing lightning and other dangerous severe weather, such as tornadoes. 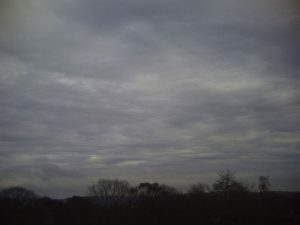 Altostratus is a middle altitude cloud genus belonging to the stratiform physical category characterized by a generally uniform gray to bluish-green and sheet or layer. It is lighter in color than nimbostratus and darker than high cirrostratus. The sun can be seen through thin altostratus, but thicker layers can be quite opaque. Altocumulus is a middle-altitude cloud genus that belongs mainly to the stratocumuliform physical category characterized by globular masses or rolls in layers or patches, the individual elements being larger and darker than those of cirrocumulus and smaller than those of stratocumulus. A stratocumulus cloud belongs to a genus-type of clouds characterized by large dark, rounded masses, usually in groups, lines, or waves, the individual elements being larger than those in altocumulus, and the whole being at a lower altitude, usually below 8,000 ft. Weak convective currents create shallow cloud layers because of drier, stable air above preventing continued vertical development. 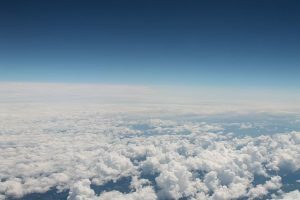 Stratus clouds are low-level clouds characterized by horizontal layering with a uniform base, as opposed to convective or cumuliform clouds that are formed by rising thermals. 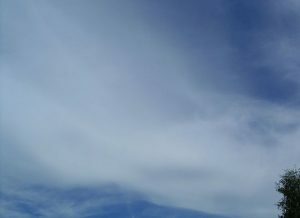 More specifically, the term stratus is used to describe flat, hazy, featureless clouds of low altitude varying in color from dark gray to nearly white. The word "stratus" comes from the Latin prefix "strato-", meaning "layer". Cumulus clouds are clouds which have flat bases and are often described as "puffy", "cotton-like" or "fluffy" in appearance. Their name derives from the Latin cumulo-, meaning heap or pile. Cumulus clouds are low-level clouds, generally less than 6,600 ft in altitude unless they are the more vertical cumulus congestus form. 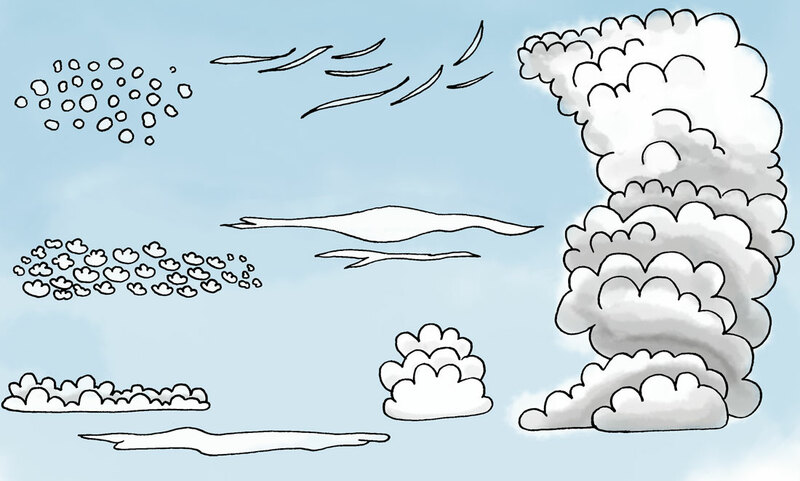 Cumulus clouds may appear by themselves, in lines, or in clusters. 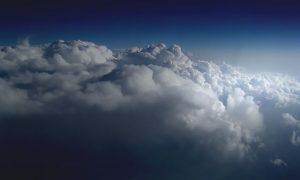 Show a photo and more information about each type of cloud by hovering your mouse over. Since there's no hover on touch devices, just tapping the cloud types on touch screens will reveal the associated information.